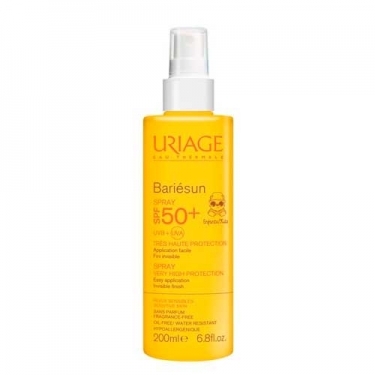 DESCRIPTION: Bariésun Spray Enfants SPF50+ from Uriage is a sunscreen spray for children's face and body. Formulated with Uriage Thermal Water, a filtering complex anti UVA-UVB, vitamins C and E and Aquaspongines, protects from UV rays, reinforces the natural protective barrier of the skin and moisturizes in depth. Hypoallergenic and non-comedogenic. Without perfume. Apply a generous amount on face and body before sun exposure. Reapply whenever necessary.